The stages and shows aren’t the only places to find beautiful art at The Smith Center for the Performing Arts. 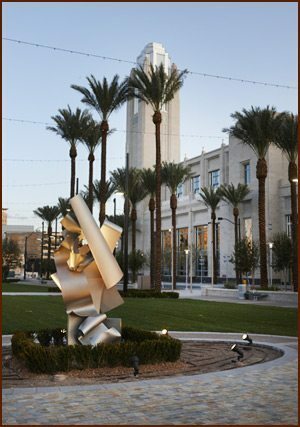 The Smith Center features both visiting art installations and commissioned pieces throughout our campus, from local Las Vegas artists and international artists alike. The Smith Center is an exhibit in and of itself, as our unique architecture demonstrates. We are happy to offer free, guided walking tours throughout the center, where visitors and residents alike can learn about the art, architecture, and history of The Smith Center. For available dates and times, click the button below. Tours are limited to twenty patrons, and are approximately sixty minutes. Participants must register online. Tours will be listed online thirty days prior to tour date. No pets are admitted other than service animals. Tours meet at the West entrance in the Grand Lobby. Please note that tours must be scheduled around the performances and work calls of the technicians, artists and administrators who produce our shows. Every tour will strive to give attendees a full experience, however due to our active performance schedule we cannot guarantee that every tour will have the opportunity to view all venues on campus.